Pancrace ROYER: Premier Livre de pièces pour clavecin (1746). Christophe Rousset (hpsi). Naïve Ambroisie AM 151 (http://www.naiveclassique.com/). Distributed in the US by Naxos (http://www.naxos.com/). Joseph Nicolas Pancrace Royer (1705-1755) had a brief but illustrious career. He taught the King’s children, managed the Concert Spirituel, and had several operas performed at Versailles. A 1742 police blotter reports a fight between Royer and Rameau, the reigning musician of the day. From what we know about their characters, Rameau definitely initiated the altercation. Dedicated to Louis XV’s daughters, Royer’s Premier Livre appeared in 1746 when the trend away from dance pieces (allemandes, sarabandes, etc.) was fairly complete. Most of these pieces are in rondeau form. Several are elaborations of themes from his operas, of which Zaïde, an opera-ballet, was the most successful. For some, Royer’s theatrics, rushing scales, heightened contrasts, and daring harmonies represent the endpoint of the French harpsichord before tastes drifted towards the fortepiano. 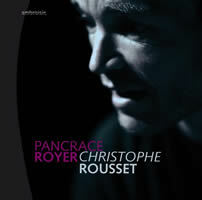 This is Rousset’s second go at Royer’s Pièces. The O/P first (l’Oiseau-Lyre 436 127-2) was taped in Aug. 1991, used a 1751 Henri Hemsch, and won the 1993 Diapason d’or. It is a much sought-after item (ArkivMusic has reissued it, but I know nothing of that disc’s quality). This Feb. 2007 recording uses an attractive Goujon-Swanen instrument, ca. 1749-84. This time Rousset stays entirely within Royer’s Premier Livre (if there were subsequent books, they are lost to us) and doesn’t program La Chasse de Zaïde, a singleton which may not be Royer’s. Fifteen-plus years later, Rousset seems less intent on demonstrating muscle and virtuosity. The emphasis here is on darkness and mystery. This shift is most audible in “la petite Reprise” of the affecting Les tendres Sentiments, the harmonies of which climb chromatically. Rousset now lingers a little longer on the twists and cadential progressions of L’Incertaine and L’Aimable. Overall, the fast pieces are about the same duration. The slower ones have become slightly longer. The newer recording is less dry, and whether it’s the instrument or player, Rousset’s 1991 staccatos are more precise (for example, snapped 16ths after dotted eighths). Le Vertigo and La Marche des Scythes, the Livre’s most theatrical and reckless, evoke slightly less passion on the newer recording. Perhaps Rousset is suffering from battle fatigue, witness Le Vertigo’s Vivaldian chord crashing. I hear greater introspection in its few points of repose. While I value both of Rousset’s explorations, I see myself spinning the older release more often. Jean-Henry D’ANGLEBERT: Suites (1689). Elizabeth Farr (hpsi, lute harpsichord). Naxos 8.570472-73 (http://www.naxos.com/). Jean-Henry D’ANGLEBERT: Pièces de clavecin (1689). Hank Knox (clavicytherium). early-music.com EMCCD-7759 (http://www.early-music.com/). Distributed in the US by Naxos (http://www.naxos.com/). “Preludes and Dances for a French Harpsichord.” Var comps. Colin Tilney (hpsi). Doremi DDR-71152 (http://www.doremi.com/). Distributed in the US by Allegro Music (http://www.allegro-music.com/). 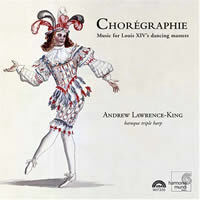 “Chorégraphie: Music for Louis XIV’s dancing masters.” Var comps. Andrew Lawrence-King (baroque triple harp). Harmonia Mundi HMU 907335 (http://www.harmoniamundi.com/). At Louis XIV’s court, D’Anglebert occupied the harpsichordist’s post between the tenures of Chambonnières and François Couperin. By rights, the job was inherited (“survivance” or “reversion”). However, D’Anglebert bought it from his predecessor, with Couperin eventually claiming it from D’Anglebert fils, whose vision was impaired. Lully loomed large during D’Anglebert’s tenure, to the effect that several pieces in the 1689 collection — some may argue the best — are in fact keyboard arrangements of Lully. Despite Farr’s stately playing, the lute harpsichord’s prissy tone grows wearisome. While I’m a harpsichord enthusiast, I remain sympathetic to those who find its sound irritating. Certainly, the lute harpsichord would usher such folk to the brink instantly. Its plucked gut-strings remind me of computerized harpsichord models the unvarying timbre of which trumps spontaneity. D’Anglebert’s modest music benefits from a harpsichord’s slightly longer decay time and crustier attack. 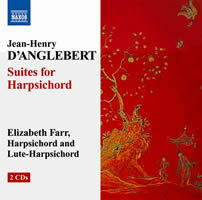 Tellingly, Farr takes the minor-key suites (G and D minor) on harpsichord and the relatively flippant major ones (G and D major) on lute harpsichord (Keith Hill fashioned both instruments). Something special happens in the closing variation sets for the minor-key suites, their repetitions permitting greater development than most of the ternary dance pieces. Properly, they are a Passacaille (G minor) and 22 couplets on the pop tune Les Folies d’Espagne (D minor). From D’Anglebert’s 57 pieces, Knox extracts just 28, including the grand Tombeau de Mr. de Chambonnières. 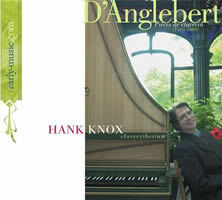 Knox performs samples from the suites in D minor, G major and G minor, and includes several Lully arrangements that happily contrast with D’Anglebert’s dry, lute-leaning pieces. Farr plays none of the Lully transcriptions or errata, a significant miscalculation as the long spans of dance pieces blur into ornamented noodling. The Lully paraphrases add variety and introduce different forms (D’Anglebert’s Lully offers the first keyboard ouvertures). I can’t understand why Farr makes no attempt at an intégrale, especially as front-runner Rousset’s cool 2000 release (Decca 458 588-2, recorded in 1996) is out of print. Knox’s subset, on a 2002 Yves Beaupré clavicytherium (essentially an upright harpsichord) after a 1768 Albertus Delin, proves more agreeable and gives D’Anglebert a better airing. Perhaps D’Anglebert’s oeuvre ought to be sampled in small doses, in context alongside others. 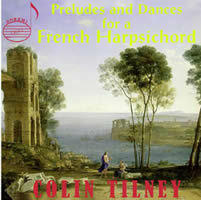 On his modestly titled recital, “Preludes and Dances for a French Harpsichord,” Tilney includes one D’Anglebert prelude (G minor) and one Lully arrangement, Les Songes agréables d’Atys. Uncle and nephew Louis and François Couperin predominate on this wide-ranging disc. As expected, Rameau’s Les Tendres Plaintes and Le Grand’s La Convalescente hold great interest, matched by Louis-Claude Daquin’s Les Enchaînements harmoniques and La Mélodieuse. Tilney plays a 1991 Yves Beaupré modeled on a late-17th-century French instrument. Back in 1987, Kenneth Gilbert (one of Knox’s teachers) may have taken the most judicious approach, programming only D’Anglebert’s Lully transcriptions (Harmonia Mundi HMC 901267). D’Anglebert and Lully along with André Campra and others appear on “Chorégraphie” which offers music from the “first baroque dance-book,” Raoul-Auger Feuillet’s 1700 Chorégraphie, played on a baroque triple harp. The CD’s nicely designed booklet reminds us how 17th- and 18th-century French music was actually used. Feuillet was the first to print dance steps (actual symbolic diagrams showing foot position, motion, etc.) alongside pictures and music. Feuillet and later his student Dezais published annual Recueils de danses for 25 years, and those eager to make positive impressions at court would subscribe and learn the new steps. Harpist Lawrence-King’s five-section program constructs thematic suites from early dance publications. Twelve of the 23 tracks contain Lully, though not every arrangement is D’Anglebert’s. Despite detailed notes, some of the music’s pedigrees aren’t precisely clear. Lawrence-King’s instrument, a 2004 Chris Barlow modeled after 17th-century Italian baroque triple harps (three parallel rows of strings, no pedals), produces resonant bass notes and pearly highs. Perhaps the evidence speaks for itself that so few recent recordings attempt D’Anglebert on harpsichord, though folks coming to Chorégraphie are probably interested in the trappings of Louis XIV’s court and would be charmed by Lawrence-King’s agreeable ambience regardless of what was played. “Affetti cantabile.” Girolamo FRESCOBALDI: Asst. comps. Hank Knox (hpsi). early-music.com EMCCD-7767 (http://www.early-music.com/). Distributed in the US by Naxos (http://www.naxos.com/). Dietrich BUXTEHUDE: Suite in A major, BuxWV 243; Canzonetta in D minor, BuxWV 168; Suite in F major, BuxWV 238; Prelude in G major, BuxWV 162; Aria: “La Capricciosa” in G major, BuxWV 250. Lars Ulrik Mortensen (hpsi). Naxos 8.570581 (http://www.naxos.com/). 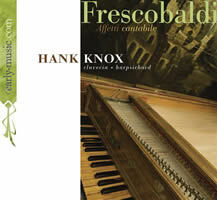 Knox’s 15-piece Frescobaldi sampling ably represents the Italian master. The quarter-comma meantone tuning (mésotonique), which might raise a few eyebrows, makes the remote modulations juicy, especially in the longest entry, the Cento partite sopra passacagli (publ. 1637). Most of the pieces, from Frescobaldi’s acclaimed 1627 Il secondo libro di toccate, are rich with counterpoint and frisky rhythms. I’ve found this single disc easier to digest than Sergio Vartolo’s multi-disc Tactus releases (O/P). Knox equally shows off his own skills as well as Frescobaldi’s. He borrows one of Kenneth Gilbert’s instruments, made by an anonymous 17th-century Italian maker. Somehow the old harpsichord appeared in Cambridge, Mass., where it was rescued by none other than Frank Hubbard and William Dowd. Hubbard documented its restoration in Three Centuries of Harpsichord Making, and Gilbert acquired it in 1965. The instrument, which has gone back and forth between North America and Europe, now resides in Montreal. Quite possibly James McNeill Whistler owned it, for it appears in several of his paintings (including the one of his mother). The artist painted dragonflies upon its case. While any good theme-and-variations will engage my interest, Buxtehude’s mammoth La Capricciosa warrants more press. Forgive the apostasy, but this collection takes Bach’s Goldberg Variations down a notch or two: Both sets contain 30 or more variations on a G-major theme and have similar chord progressions. If you listen closely, part of Buxtehude’s theme appears in Bach’s closing quodlibet. We don’t know for certain whether Bach knew this work, but it’s safe to assume he did. 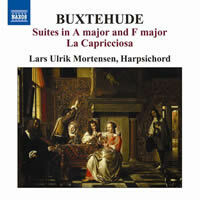 This is the third volume in Mortensen’s Buxtehude series which Naxos has brought over from Dacapo. The mild suites (allemande, courante, sarabande and gigue) reflect French dance movements and lute gestures (style brisé) and are less inventive than La Capricciosa. A contemporary source mentions several keyboard suites representing the planets, but these have never been identified or found. Mortensen’s commanding style is disarming, though obviously, I’ve spent more time with his thrilling take on Buxtehude’s 32 variations. No information is given on the instrument. The tuning is probably meantone, to judge from the chromatic tang of La Capricciosa’s Partite 12.